Avoid courtroom showdowns by following proper termination procedures. Letting an employee go is never pleasant, and doing it the wrong way can lead you down a dangerous path to litigation. Now you can learn the easy-to-follow guidelines that will help you terminate employees legally with The Complete Employee Termination Kit. Includes an 84-page manual PLUS a CD with forms, letters and contracts you can easily customize for your own needs! Yes, I want to be able to terminate employees without worrying about the legal consequences. Send me The Complete Employee Termination Kit. I'll review the manual and CD risk-free. If the kit is anything less than promised, I'll return it and you'll refund my entire purchase price. Terminate my stress. Send my kit right away! Terminating an employee is stressful, no matter what the reason. Perhaps a bad employee has reached the end of the disciplinary road. Or maybe the economy has forced you to cut back on personnel. Either way, with so much tension during the termination process, you may not remember to follow the proper procedures – especially if you are not exactly sure of them to begin with. That’s where The Complete Employee Termination Kit comes in. This thorough yet easy-to-use resource gives you the tools to easily walk step by step through the process. Termination still won’t be fun, but you’ll know you’ve done everything right – and helped protect your company from litigation-seeking former employees. An 84-page manual that addresses everything you need to know about disciplinary terminations, layoffs/RIFs, employment law, the termination meeting, pay, benefits and more. A companion CD with the complete manual, so you can easily have the information at your fingertips in your office, at home, on your laptop, wherever you need it. Also on the CD, more than a dozen customizable documents, from a confidentiality agreement form to sample layoff-notification letter to a post-termination checklist. Save them to your hard drive, then simply plug in the facts about a specific employee, as needed. Send me The Complete Employee Termination Kit immediately, with your no-questions-asked money-back guarantee. I want the kit now, so I'm ready to conduct my next termination the right way. The Complete Employee Termination Kit covers everything you’d expect – and more. All designed to give you proven procedures and the peace of mind that comes from following them. Pre-Termination Steps. The evidence you need, the notice you should give. An Honest and Reasonable Belief. The legal standard for when you don’t have absolute proof of misconduct. When Situation Warrants Immediate Termination. Exactly what to do and when to do it. The Long Walk Out the Door. How to preserve the employee’s dignity. Employers Bear Burden in Age-Based Disparate Impact Suits. Better know about this recent Supreme Court decision. Who Stays, Who Goes? Protection against discrimination claims. Using Performance as a Layoff Criterion. How to avoid bias claims. Carrying Out Terminations. The how is as important as the who. Treatment must be consistent. Some Layoffs Require Advance Warning. One federal law applies here – do you know it? Who’s Covered Under WARN. Learn if you need to be concerned – or not at all. Who Gets Notified. Not everyone. Learn the exceptions. How to Provide Notice. Very specific rules here. Better know ’em. Laws Against Discrimination. The basic legalities of termination. Reinstatement From Leaves of Absence. Learn which employees are protected. Termination Could Be Unfair Labor Practice. Use extreme caution here. Discharge for Jury Service Prohibited. No exceptions! No Polygraph-Based Terminations. You must have other evidence. Laws Prohibiting Retaliation. Questions to ask yourself, to avoid getting into trouble. The Basics: 7 Procedures to Follow. Make sure you do all seven. Termination Meeting Topic List. Address all of these, too. COBRA Continuation Coverage. A topic so important it merits 12 pages. Giving References on Terminated Employee. A consistent policy is a must here. Layoffs: Conveying the Message. Who delivers it. How. When. Handling Waivers and Releases. How to think like a judge would think. Complying With OWBPA. How to avoid claims of age bias. Valuable OWBPA Waiver Lessons. Learn from others’ mistakes. If the Terminated Employee Becomes Volatile. Defensive strategies to protect you and others. Could a Former Employee Be Plotting Electronic Revenge? How to protect your systems and data. Resignation: A Different Kind of Termination Meeting. Yes, you need procedures for this as well. Must You Pay Out Vacation Time? Big money is at stake here. Can We Make Deductions From Final Paychecks? Sometimes yes, sometimes no. When Must We Provide Final Paycheck? Consult your state law (we give you a website link). What Should a Severance Benefits Plan Entail? First rule: Have a plan to begin with. Unemployment Insurance: Ways to Reduce Employer’s Liability. You may be liable even if an employee quits! Learn how to minimize the risk. Ways to Encourage Employee Participation. Don’t miss the opportunity for valuable feedback. BONUS: How to address exit interview revelations, such as harassment complaints. Best Person to Conduct the Exit Interview. Not necessarily the supervisor. The Best Questions to Ask. Including special questions for voluntary resignations. Conducting the Exit Interview. Formal? Casual? Written? How to choose. There’s also a handy index so you can find any topic with ease in the printed manual. Plus, the CD version has a search function. The Complete Employee Termination Kit is worth getting for the printed manual alone. But you also get what makes it a complete kit: the CD with the manual plus 15 customizable forms, letters and sample legal agreements. You have better things to do than create termination paperwork. Save yourself the writing and typing, and use the 15 essential documents you’ll find on the CD. Simply save them on your hard drive and edit as needed. Your printed manual of The Complete Employee Termination Kit includes all those documents as well, so you’ll have hard copies for quick reference. But when you’re actually using the documents, you’ll want to start with the RTF versions on the CD and customize them from there. The Complete Employee Termination Kit makes firings and layoffs less stressful, and helps reduce legal risk for your company. As for buying the kit, you have no risk whatsoever, thanks to our guarantee. 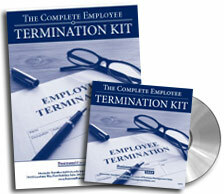 Every employer needs The Complete Employee Termination Kit. There’s simply too much at stake, from company morale to the bottom line – even personal safety. Our decision was based on an objective business reason or other legitimate criterion. There was sufficient evidence supporting the decision. Company policies and practices were followed. The employee was given a fair chance to retain employment, as applicable (such as progressive discipline). The employee was given proper warning of the decision. Proper documentation has been completed. Why risk having your next termination go bad – not just unpleasant, but leading to a huge lawsuit? Order The Complete Employee Termination Kit right now and learn the steps, tools and tips you need to properly document actions, break news to employees, conduct exit interviews and comply with employment laws. I hate terminations as much as any employer. That’s why I make sure my company follows the guidelines in this kit. Your organization deserves to benefit as well, so I’m happy to offer a 100% money-back guarantee, just so you’ll examine the kit for yourself. Go ahead. Get the manual in your hands. Put the CD in your computer. Discover how The Complete Employee Termination Kit will make an unpleasant task a lot easier – and possibly save you from legal agony down the road. Indeed you may, but that doesn’t prevent an angry employee from filing a lawsuit about supposed discriminatory or retaliatory intent. Even if you ultimately prevail in court, the best (and cheapest) way to win is by not going to court in the first place. It’s all the more reason to get The Complete Employment Termination Kit – and use it. When you follow the careful, tactful procedures as recommended, an employee may be less likely to seek revenge, and an attorney may be less likely to accept a case. Order now.